Make every Wednesday date night at your favourite sushi restaurant. Set on the beach front of the Western Cape’s number one surfers suburb, Live Bait Muizenberg offers casual, yet stylish, beach house dining with the freshest seafood, mezze and of course, sushi. Housing an extensive wine list, you’re spoiled for choice with an array of proudly South African wines. Known for their efficient service, Live Bait won’t keep you waiting to enjoy mouth-watering dishes prepared in their central kitchen. Surrounded by decor that reflects the crashing waves and blue skies before you, grab a private corner and let the cool blues and whites envelop you and that special someone or bring your whole posse in from the surf to curb that hunger. We’re ready to give you a taste adventure to remember at Live Bait Muizenberg. Enjoy half-price sushi as good as the setting its served in. Already reasonably priced, half-price is just a steal! Including all your favourites such as Maki, Rainbow, Sashimi and Salmon Roses for your love. 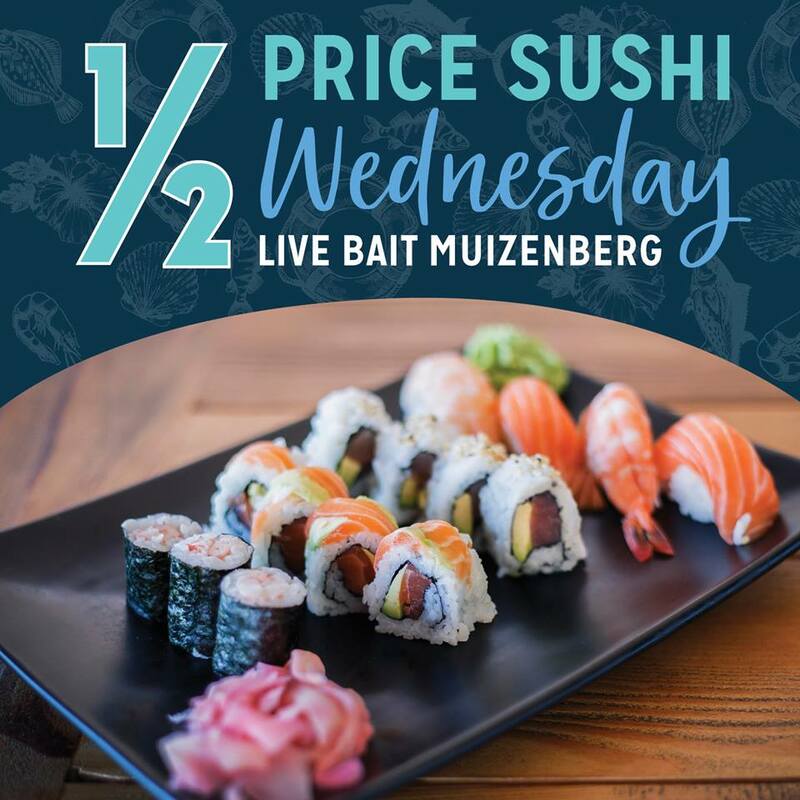 Bring your friends, your family and your appetite to Live Bait Muizenberg for the best bargain you’ve ever tasted. Book now.